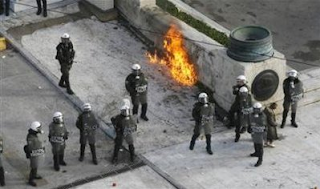 The IMF finally announced it’s Latvia “bailout” plan on Friday. The plan involves lending about â‚¬1.7 billion ($2.4 billion) to Latvia to stabilise the currency and financial support while the government implements its economic adjustment plan. The loan, which will be in the form of a 27-month stand-by arrangement, is still subject to final approval by the IMF’s Executive Board but is likely to be discussed before the end of this year under the Fund’s fast-track emergency financing procedures, and it is not anticipated that there will be any last minute hitches (although I do imagine some eyebrow raising over the decision to support the continuation of the Lat peg). 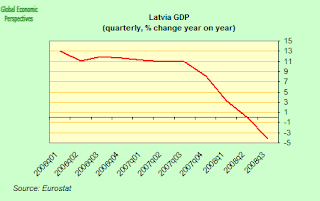 The Latvian government admits that some of the IMF economists involved in the negotiations advocated a devaluation of the lat as a way of ammeliorating the intense economic pain involved in the now inevitable economic adjustment. But the government in Riga stuck to its guns (supported by the Nordic banks who evidently had a lot to lose in the event of devaluation), arguing that the peg was a major credibility issue, and the cornerstone of their plan to adopt the euro in 2012. “It (the programme) is centered on the authorities’ objective of maintaining the current exchange rate peg, recognizing that this calls for extraordinarily strong domestic policies, with the support of a broad political and social consensus,” said IMF Managing Director Dominique Strauss-Kahn. Less than 10 percent of the way into the book (to be fair, my edition weighs in at just under 900 pages), I’m liking In Europe: Travels Through the Twentieth Century by Geert Mak a great deal, and looking forward to the rest. On April 16, 1947, the SS Grandcamp exploded in the harbor of Texas City, Texas. The ship was carrying ammonium nitrate as part of Marshall Plan relief for post-war Europe. Ammonium nitrate is both an effective fertilizer and a potent explosive, and the Grandcamp was carrying more than 2300 tons of the substance when a fire below turned into an explosion that produced a mushroom cloud reminiscent of an atomic blast. The Texas City waterfront was also home to chemical plants, and storage facilities for numerous petrochemical products. Many of these also caught fire and exploded in part. Several hundred people died; the exact total is unknown because of the completeness of the destruction at the explosion’s center. An important story, very badly told. In view of Greece’s EMU membership, the availability of external financing is not a concern, but the correction of cumulating indebtedness could weigh appreciably on growth going forward. 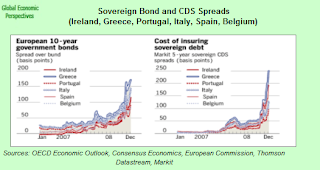 While the risk of transmitting vulnerabilities to the euro area is very small reflecting Greeceâ€™s small relative size, large persistent current account deficits would increase the vulnerabilities to a reversal in market sentiment, leading to a corrective retrenchment of private sector balance-sheets in the face of rising indebtedness, and a possible appreciable rise in the cost of funding over time. These developments would have significant negative implications for growth. The above quited paragraph from the IMF is a very good example of what used to be the orthodox wisdom about Greece’s economic imbalances – that given EMU membership the availability of external financing should not be a concern, and that the Greek economy is effectively too small for it to constitute a menace to the stability of the eurozone itself, even on a worst case scenario. Well, if we look at the growing yield spreads you can see in the chart above (please click for better viewing) the first premiss seems to be in real danger of falling, EMU membership no longer gives an automatic guarantee of oncost-free external financing, and if you look at the names of the other countries lining up in the queue behind Greece – Italy, Spain and Portugal in particular – you can begin to see the outline of a contagion mechanism whereby the coming to reality of the worst case Greek scenario might just extend itself into a problem of sufficient magnitude to transmit Greek vulnerabilities across and into the entire euro area. No one is too small to be a problem when it comes to financial crises, and if you think I am exaggerating just look at how the “pipsqueak” Baltic economies have paved the way and opened the door to much bigger problems right across Central and Eastern Europe even as I write.